Working with tickets can become a bewildering task. Many options are given to process, or close tickets, even if they are not needed in the current state of a ticket or due to the role of the current agent. Hiding unneeded entries cleans up the menu bar and gets it easier to work with, hiding values from dynamic fields or next queues lowers chance of human error. OTRS uses access control lists (ACL) to restrict agents and customer users on ticket options, allowing only correct and meaningful activities with a ticket. OTRS administrators can easily generate ACLs in the graphical interface to prevent ticket closure until meeting specific requirements, prevent tickets from being moved to queues before adding the defined information and much more. Use this screen to manage access control lists in the system. A fresh OTRS installation contains no access control lists by default. The access control lists management screen is available in the Access Control Lists (ACL) module of the Processes & Automation group. When creating some access control lists, please keep in mind that they are executed alphabetically as displayed in the access control lists overview. ACL restrictions will be ignored for the superuser account (UserID 1). Click on the Create New ACL button in the left sidebar. You will be redirected to Edit ACL screen to edit the ACL structure. Click on an ACL in the list of ACLs or you are already redirected here from Create New ACL screen. Modify the fields and the ACL structure. Click on an ACL in the list of ACLs. Set the Validity option to invalid or invalid-temporarily. Click on the Save button. A new Delete Invalid ACL button will appear in the left sidebar. Click on the Delete Invalid ACL button. ACLs are written into ZZZACL.pm file in Perl format. Without deploying, all ACLs are still in this cache file even if they are deleted or the Validity option is set to invalid or invalid-temporarily. Don’t forget to deploy all ACLs after modifications! Click on the Deploy ACLs button in the left sidebar. New or modified ACLs have to deploy in order to make affect the behavior of the system. Setting the Validity option to valid just indicates, which ACLs should be deployed. Click on the Export ACLs button in the left sidebar. Click on the Overwrite existing ACLs? checkbox, if you would like to overwrite the existing ACLs. Click on the Import ACL configuration(s) button. Deploy the imported ACLs with Deploy ACLs button. If several ACLs are added to the system, use the filter box to find a particular ACL by just typing the name to filter. ACLs are evaluated in alphabetical order. This setting disables the evaluation of the subsequent ACLs. The ACL definition can be split into two big parts, Match settings and Change settings. In the matching sections the ACLs contain attributes that has to be met in order to use the ACL. 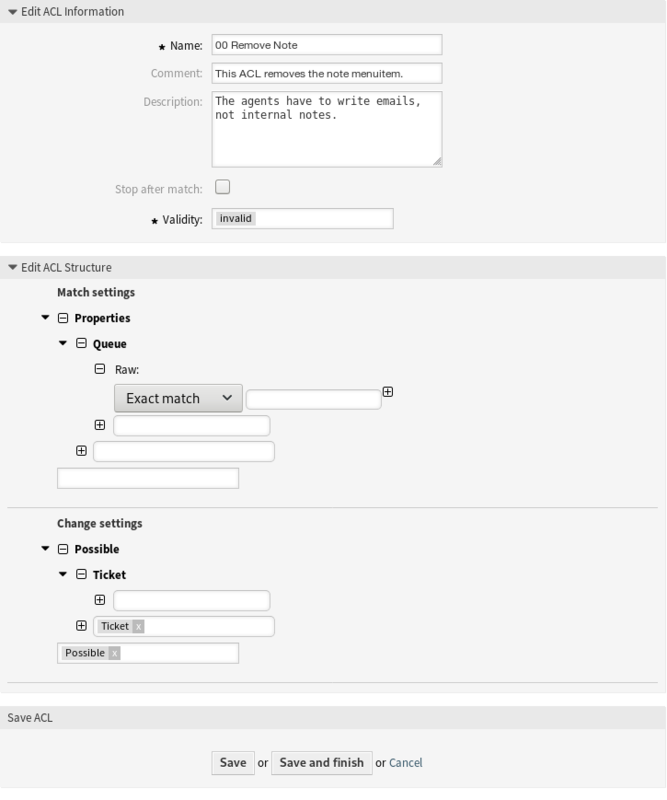 If the attributes defined in the ACL do not match with the attributes that are sent, then the ACL does not take any affect, but any other match ACL will. The change sections contain the rules to reduce the possible options for a ticket. This section contains matching options that can be changed on the fly. For example on a ticket creation time the data of the ticket changes dynamically as the agent sets the information. 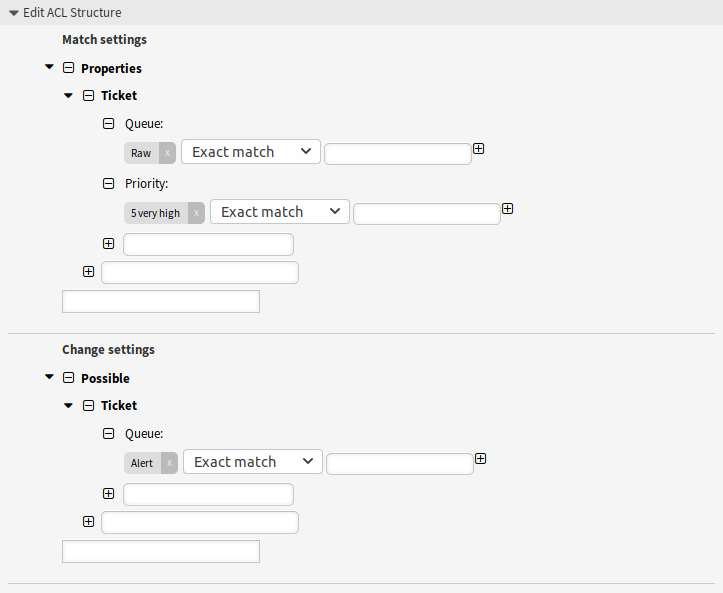 If an ACL is set to match a ticket attribute then only when the matching attribute is selected the ACL will be active and might reduce other ticket attributes, but as soon as another value is selected the ACL will not take any affect. 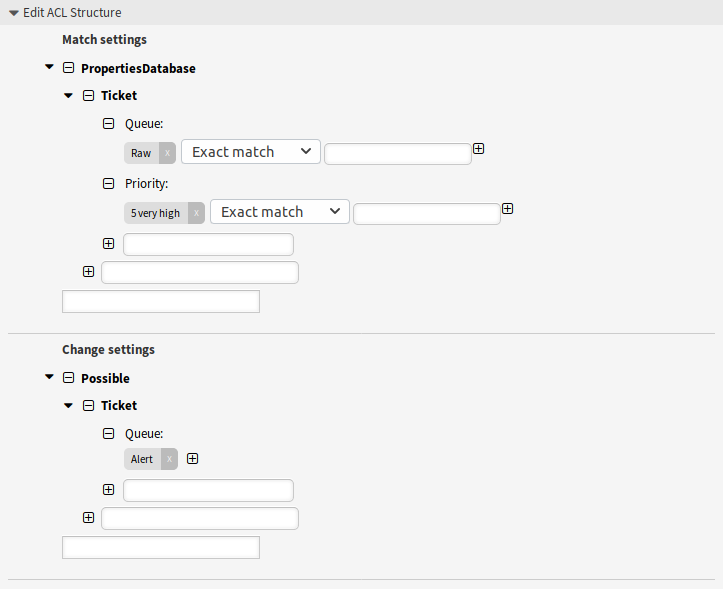 This section is similar to Properties but does not take changes in ticket attributes that are not saved into the database, this means that changing an attribute without submit will not make any effect. This section is not use for ticket creation screens (as tickets are not yet created in the database). This section is used to reset the data to be reduce to only the elements that are set in this section. This section is used to add missing elements that were reduced in other ACLs. This section is only used in together with other ACLs that have Possible or PossibleNot sections. This section is used to remove specific elements from the current data. It could be used stand alone or together with other ACLs with a Possible or PossibleAdd sections. This modifier is used to negate a value, for example [Not]2 low. Talking about priorities will be the same as to have: 1 very low, 3 normal, 4 high, 5 very high. It is used to define a regular expression for matching several values, for example [RegExp]low. In this case talking about priorities is the same as 1 very low, 2 low. It is very similar to [RegExp] but it is case insensitive. Negated regular expressions, for example [NotRegExp]low. Talking about priorities is the same as 3 normal, 4 high, 5 very high. It is very similar to [NotRegExp] but it is case insensitive. This example shows you how to allow movement into a queue of only those tickets with ticket priority 5 very high. First, it needs to have a name. In this case, it is 100-Example-ACL. Note that the ACLs will be numerically sorted before execution, so you should use the names carefully. The comment and the description fields are optional. Secondly, you have a Properties section which is a filter for your tickets. All the criteria defined here will be applied to a ticket to determine if the ACL must be applied or not. In our example, a ticket will match if it is in the queue Raw and has priority 5 very high. This is also affected by changes in the form (e. g. if the ticket is the queue Raw and had a priority 3 normal at this moment the ACL will not match, but then priority drop-down is selected and the priority is changed now to 5 very high then will also match). Lastly, a section Possible defines modifications to the screens. In this case, from the available queues, only the queue Alert can be selected in a ticket screen. Don’t forget to set Validity to valid and deploy the newly created ACL. This example is very similar to the first one, but in this case only tickets in the queue Raw and with a priority 5 very high, both stored in the database will match. This kind of ACLs does not consider changes in the form before the ticket is really updated in the database. This example shows how to disable the closing of tickets in the queue Raw, and hide the close button. 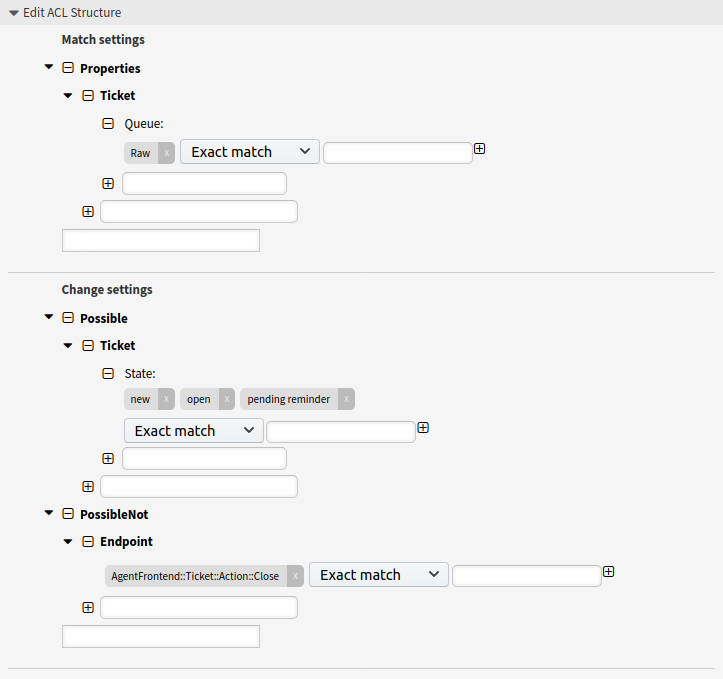 It is possible to filter a ticket field (state) with more than one possible values to select from. It is also possible to limit the actions that can be executed for a certain ticket. In this case, the ticket cannot be closed. This example shows how it is possible to define negative filters (the state closed successful will be removed). 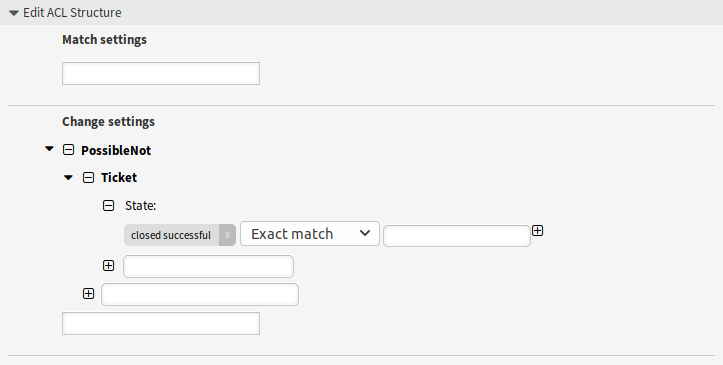 You can also see that not defining match properties for a ticket will match any ticket, i. e. the ACL will always be applied. This may be useful if you want to hide certain values by default, and only enable them in special circumstances (e. g. if the agent is in a specific group). 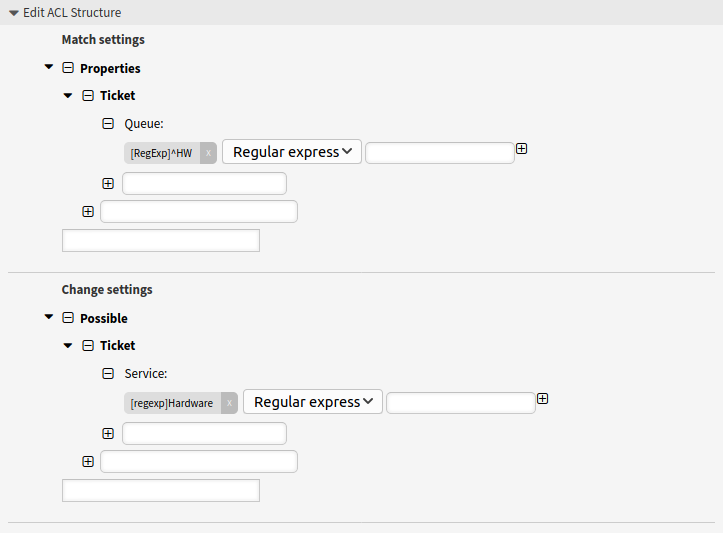 This example shows you how you can use regular expressions for matching tickets and for filtering the available options. This ACL only shows Hardware services for tickets that are created in queues that start with HW. This ACL restricts the process P14 in the external interface using the customer ID TheCustomerID. Properties, keys and values that can be used in ACLs are highly depend on the OTRS installation. For example the possibilities can be extended by installing extension modules, as well as it can be depend on the customer user mapping set in Config.pm. Therefore it is not possible to provide a full ACL reference, that contains all settings. For properties, keys and values that can be used in ACLs, see the following example ACL in YAML format. 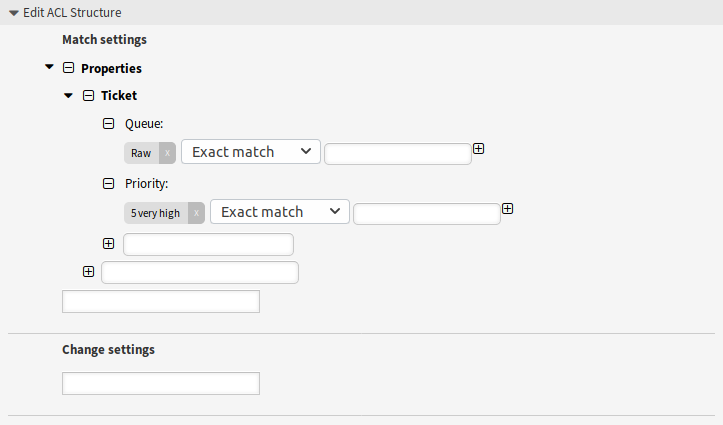 # Match properties (current values from the form). # Names must be in DynamicField_<field_name> format. #   data values shown to the user. 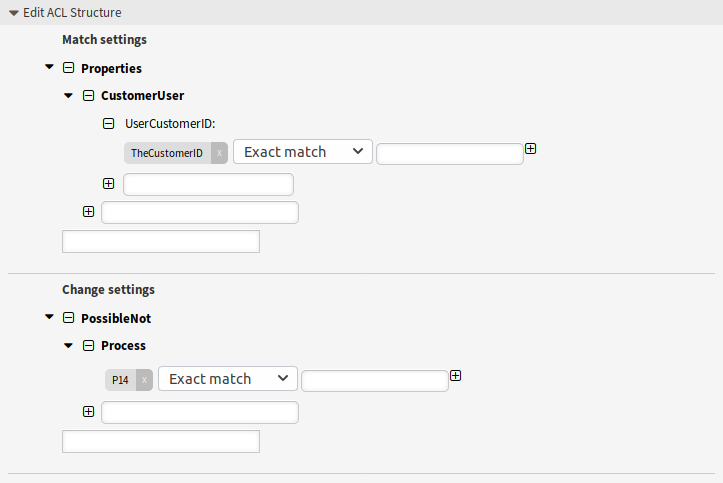 # Match properties (existing values from the database). # Please note that Frontend is not in the database, but in the framework. # See section "Properties", the same configuration can be used here. # Reset possible options (white list). # Possible action options (white list). # Limit the number of possible activity dialogs the agent/customer can use in a process ticket. # Limit the functions on external interface. # Limit the number of possible processes that can be started. # Possible ticket options (white list). # Add options (white list). # See section "Possible", the same configuration can be used here. # Remove options (black list). Description: This is the long description of the ACL to explain its usage.